As the sonnet approaches its nominal seven hundredth birthday, counting from Dante and Petrarch, that is, not from Will Shakespeare, who courageously turned the form in an accommodating way, we speculate on why such vigor, such appeal, such legs. The final couplet is the poem’s defining feature. Once the original mold was broken the only proviso to stand up was the convention of fourteen lines. Could its apple-cheeked health be explained by its trim, modest fourteen-line foundation, its good-natured adaptability, its willingness to go along with nearly every theme a poet might wish to dress her up in? Sure. But talent underscores talent, and the 100 poems presented in this volume, with a page or three of extrapolation and comment by esteemed experts, work well to show off the form. We find within the volume some of the oldest recorded sonnets, several from the Victorian and Georgian era, a parcel from the early and “post-modern” era, and an assortment (Whitmanesque) from America, Europe, and other “overseas” stations. The package is complete. The earliest are Elizabethan poems, moving chronologically at an steady pace: three from the Bard and his contemporaries, a generous showing from the Romantics, where we discover the usual suspects: Wordsworth, Coleridge, Shelley and Keats. Every poem is accompanied by interpretive notes from editors Stephen Burt and David Mikics, professors of English from Harvard and the University of Houston, respectively. Their scholarship is worthy and accessible. The reader is unlikely to feel he or she is sitting in on a lecture one or more grade levels removed from one’s comfort zone. Their focus on readers works just as well for scholars as for the practicing poets among us who want to more successfully work in the form. Ozymandius makes his storied appearance, even as the quintessentially-mortal subject is further lost to the sands of time. Dramatic monologue is in full fig, with one (enough!) from Liz Barrett Browning. You will not soon find another poem with four exclamation marks and four ellipses. But maybe such love poems are entitled to more emotional gambits than something held tight and tidy, such as William Meredith’s beautiful (Italianate) and simple testament to love untested and misunderstood. Who among us is not still looking for Petrarch’s Laura? No one did bombast better than Emma. But this was an era of immense growth and promise. The Brooklyn Bridge opened in 1883. Edison’s electric lights were streaming across New York City that year. Golden door indeed! “Poetry must have something in it that is barbaric, vast and wild,” wrote Denis Diderot one hundred years before his countrymen gave us Lady Liberty. The tempest-tossed were welcomed here, maybe to help quell all that vastness. Ever adaptive, poetry is reflective of its weltanschauung. The French will have to accommodate our purloined use of the German term, at least this once. Back to Miss Emma’s ulterior motive for writing and publishing her sonnet, David Mikics informs us that she wanted to raise money for the Statue of Liberty’s completion and delivery from France. “Pennies poured in from schoolchildren and working people. Three years later the statute was assembled and delivered.” Let’s move ahead in the volume and significantly in time. Sonnets, we agree, are adaptable. The only constant, or near-constant, is the fourteen lines. Robert Frost’s “Mowing,” an unhinged sonnet with no visible rhyme or meter, underscores the vicissitudes of nature. The poet-farmer in New Hampshire speaks of “no easy enchantment,” where “Anything more than the truth would have seemed too weak.” This poem is catholic and broad, but in a highly private sense. And what could be more representative than that of the taciturn poet, in 1913? “Mowing” appeared in Frost’s first published volume, A Boy’s Will. and that fine sprigs of white are springing from my beard. 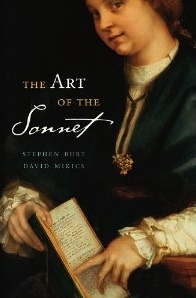 Rarely has a poetry anthology been better conceived, for purpose or pleasure. If I had to quibble it would only be to say that I had expected to find one of the best and most often anthologized of all American sonnets, “Those Winter Sundays,” by Robert Hayden. It is not included. Surely I can make a decent excuse for the good professors’ decision, as editors, to leave it out. The fact that it is so well known and loved leaves room for one more in the collection that we know less well. At the end of the day I admit that I would not want to be without medical doctor and poet Rafael Campo’s poem, from 2007, “Rest Stop near the Italian Border.” Like so many in this volume, his is a poem I will come back to. Arthur McMaster earned an MFA from the University of Florida. He now teaches creative writing and American Literature at Converse College. He is the author of Musical Muse, Wives and Lovers of the Great Composers, as well as two chapbooks of poetry. His work has been nominated for a Pushcart Prize and was twice a runner up for the James A. Hearst Poetry Prize.